George Stairs was born on August 25, 1887 to George and Helen Stairs. The Stairs family had resided in Halifax since the eighteenth century. Stairs received his elementary school education at the Harrow House, attended the Toronto private school Upper Canada College, and was a student at Dalhousie from 1904-1908. 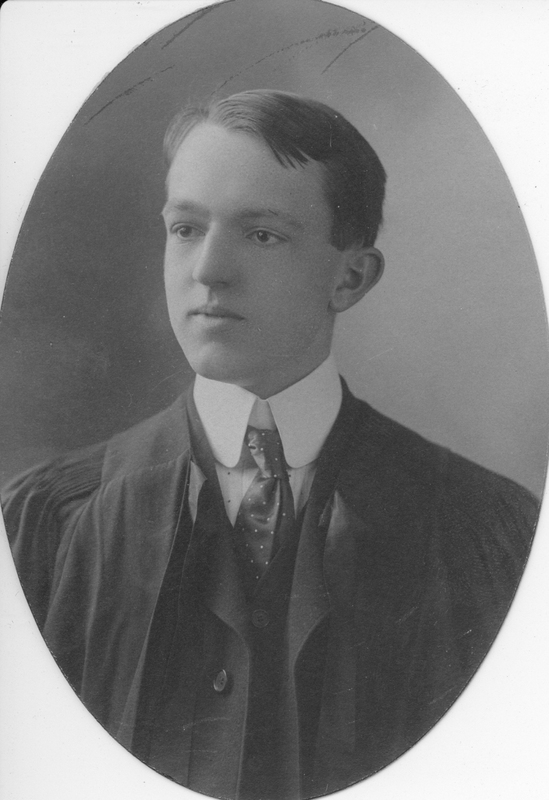 He graduated in 1909 with a Bachelor of Arts with Great Distinction, and set a new academic record with his marks. Stairs went on to work at the Montreal Trust Company for two years, moved to Vancouver to do similar work, and eventually came back to Montreal to set up a business as a manufacturer’s agent. In the early days of mobilization for the First World War, Stairs was among the first to sign up and became a Lieutenant in the 14th Battalion, Canadian Infantry unit, Quebec Regiment at Valcartier. 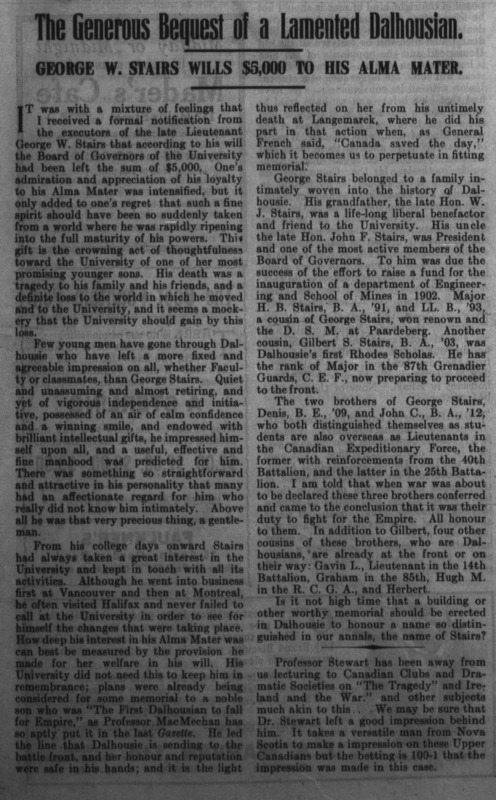 Stairs was the first Dalhousie student to die in the war. He died on April 24, 1915 while defending the Ypres Salient as part of the Second Battle of Ypres (the battle that was later commemorated by the poem “In Flanders Fields”) during the Battle of St. Julien. His brother, John, and cousins, Gavin and Graham, also passed away in the First World War. 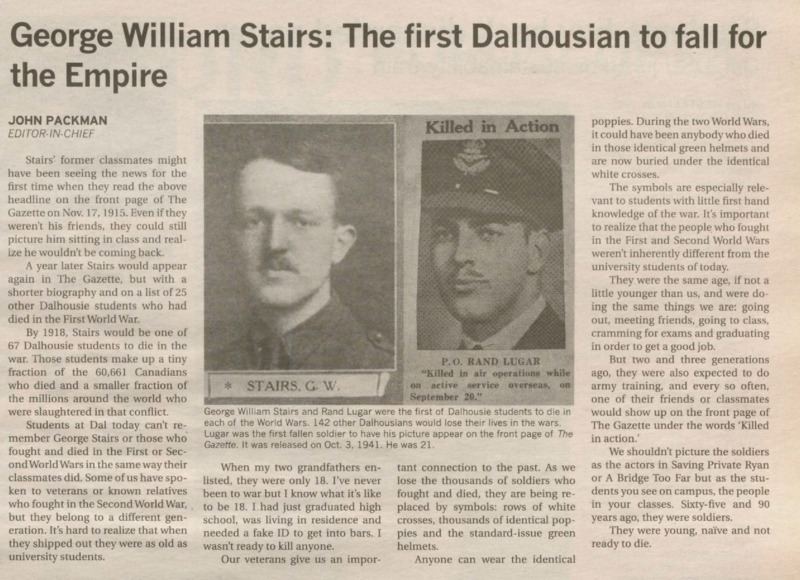 Stairs donated five thousand dollars to Dalhousie in his will, and is now memorialized at the Menin Gate Memorial in Ypres. 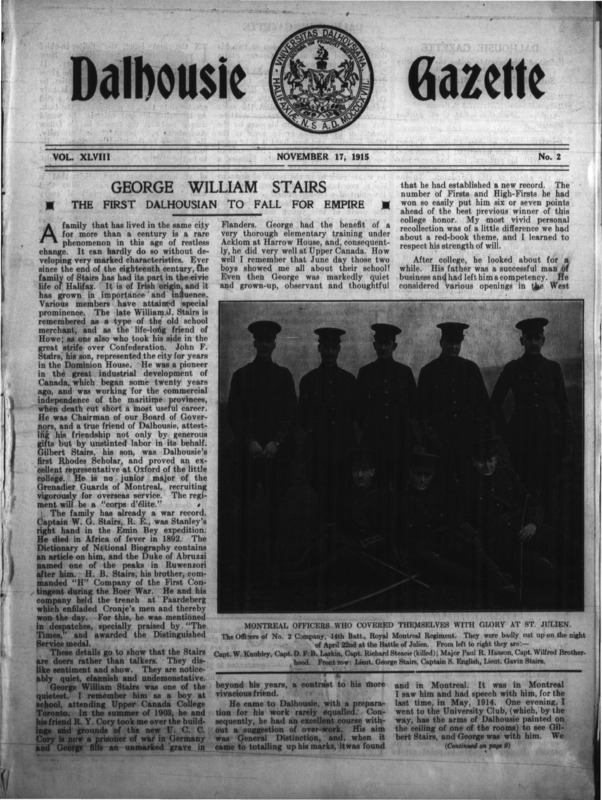 Veterans Affairs Canada, "George Stairs," The Canadian Virtual War Memorial. Upper Canada College, "Lieutenant George Stairs ’04," UCC Remembers.